It is some while since I last posted an entry and I do feel awful about that. But the past 6 months have been hectic beyond belief and only now with the finish line finally in sight do I find I have time to even contemplate an update to my blog. 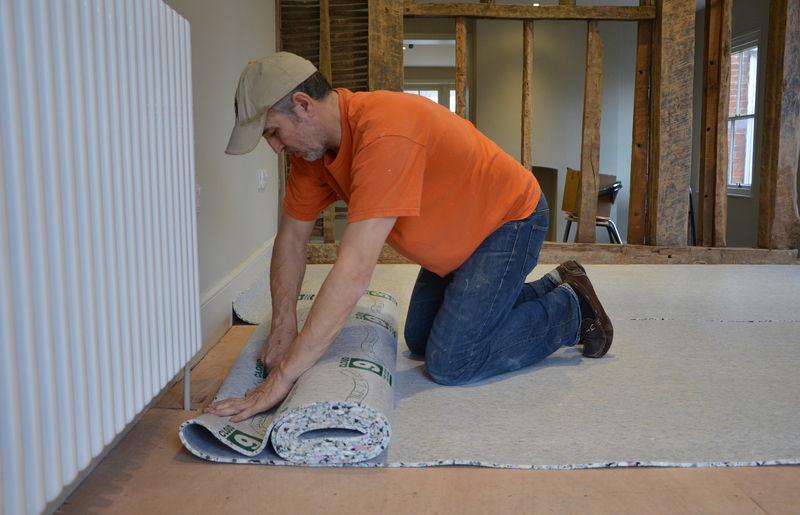 As I write the carpet is being laid and in a few days the furniture will arrive. The portico is undergoing a much-needed and long overdue face lift and the finishing touches are being made to the electrical, security and fire alarm systems. All will be ready for when Kemp & Kemp move in at the end of January. It would be nice to say that the work has gone entirely to plan but with an old Grade 2 listed Georgian building it was inevitable that there would be some unknowns. Having said that we have not been hit by too many surprises, and nothing that we perhaps could not have anticipated. We had to completely rebuild two chimneys that had clearly been rebuilt (badly) back in the 50’s or 60’s, the gas pipe through the building has been rerouted and we ended up having to re plaster the entire building, including many of the ceilings, whereas we had budgeted for patching and repairing and then papering. But when the plaster falls off as soon as you touch it there is simply no choice and the end result is so much better. The exterior to the building still needs redecoration but that can wait for a period of better weather and the courtyard gates and the courtyard itself need to be upgraded but that too can wait. 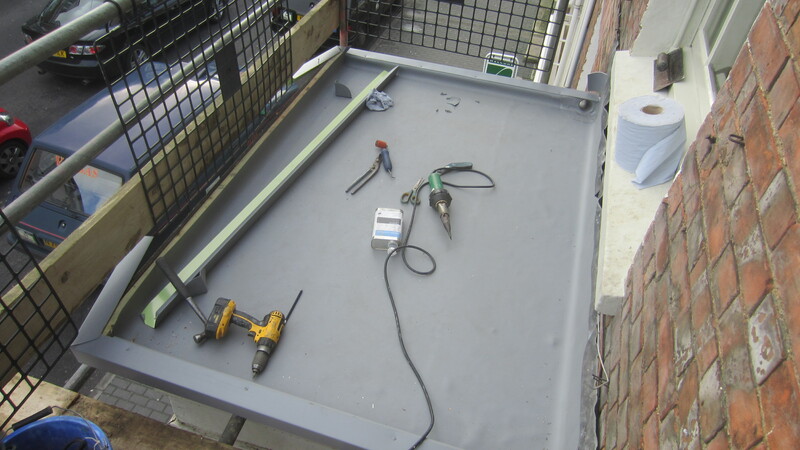 Work on the portico roof ….. Some of the tradesman that have worked in the building are convinced that it is haunted, but I do not subscribe to that, quite the opposite in fact. I have spent many a silent hour in the building, alone, late at night, and in the early days with nothing more than emergency/temporary lighting through the property and I have never felt anything other than 100% “at home”. In fact if buildings were ever able to have a soul I would credit 1 – 3 Ock St with a warm and friendly one! An original outside wall, complete with 1760 Georgian window frame! I wrote in an earlier blog about the D’Almaine family who occupied the building 100 years ago. The father was a solicitor who lived and worked from the building and sadly lost his then only son Roy (Duroy) on the Somme in 1916. Last week I was contacted by a direct descendant and we will be arranging for them and other members of the family to visit the property. I will post on that as and when it is arranged but I am very much looking forward to reuniting them with their past and to learning more about their family. 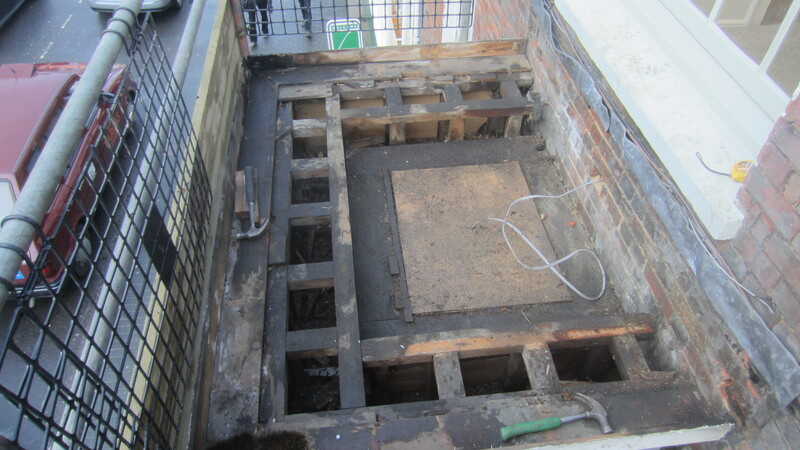 Finally, we are putting a time capsule under the floor to the building and are asking a number of Abingdon institutions and organisations to contribute to the content. As well as telling the story of the building and its new occupants, we want the Abingdonians of the future to know what life was like in Abingdon in 2014. If any of you have any ideas or suggestions do please post a comment. The strip out has begun. First the electrics and then the heating. Forty years of bodge and fudge, ruining the look and feel of a lovely Georgian building, all removed in a matter of days. Banished to the skip, or recycled in the hope that it will be put to better use next time. Pipes in a false ceiling. 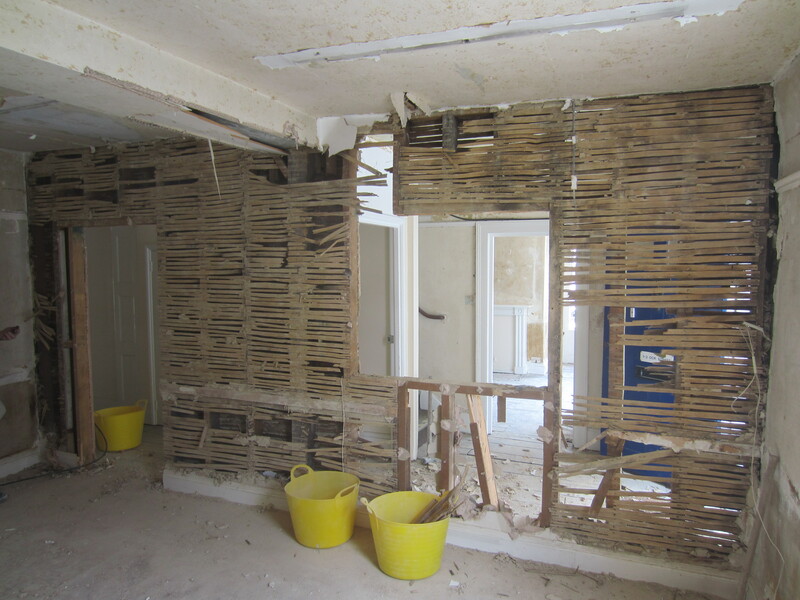 The manner in which a building has been damaged only becomes apparent when that damage is removed. Much of it is superficial and will be easily repaired but it is not difficult to condemn those that prefer the easier solution to the proper solution. But then we now live in an age when time is money and why take two hours over a job when you can bodge it in one! Anyway, the building already has a better feel to it now that it has been liberated from some of its scarring features. 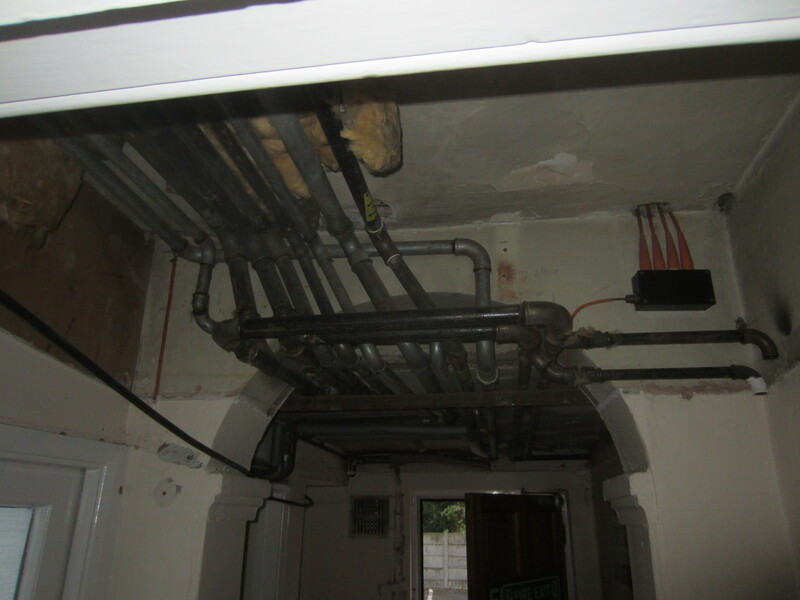 The “inside/out” archway before pipework removed. Taking the building apart before putting it back together again helps to reveal some of its true character. The original building is early Georgian, around 1760, but it is clear that it has been added to over the years, with the most recent elements perhaps early or mid – Victorian. 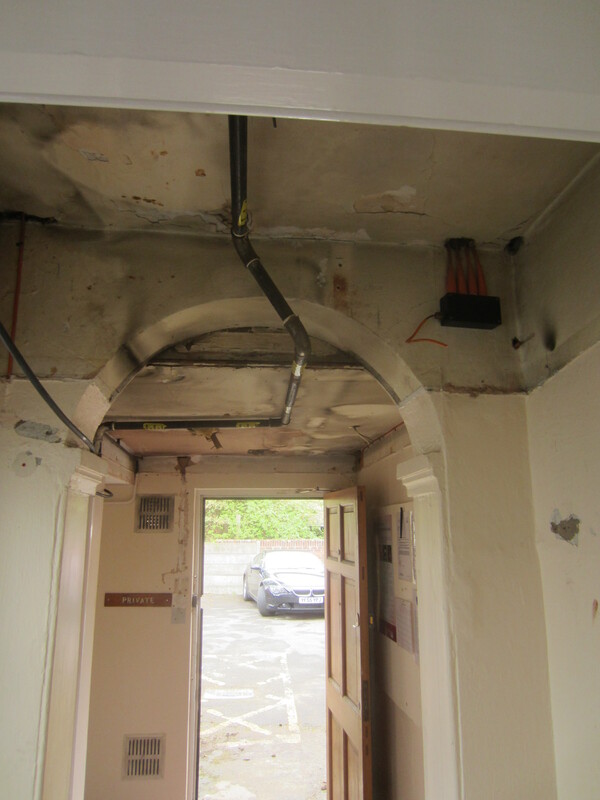 The “inside/out” arch once pipework removed. Removing a ceiling in the rear hallway to gain access to the heating pipes revealed an arch. What became immediately apparent is that the arch belonged originally to an outside porch, yet now it is inside the building. It is a lovely feature and now exposed will remain so and become a prominent and interesting part of the structure. This weekend we removed a number of the non-load bearing walls, some relatively modern, others dating back to when the building was first built. We are keen to preserve the original building as much as possible but the best way is to preserve it is to render it useful. The building needs to be fit for purpose. Opening it up internally means it is better equipped to meet the requirements and demands of a modern office environment and that in itself should help to ensure its preservation. The removal of the wall between the proposed reception room and the entrance hall revealed a large oak beam that must have taken many men to install back in 1760. It is enormous and made us consider what life must have been like for the builders of the day. No power tools or hydraulics, no mechanised lifting gear or Acrows, just skill, knowledge, grunt and brute force. Anyway, having exposed the beam we will now make a feature of it. Now gone! The partition wall to the hallway. 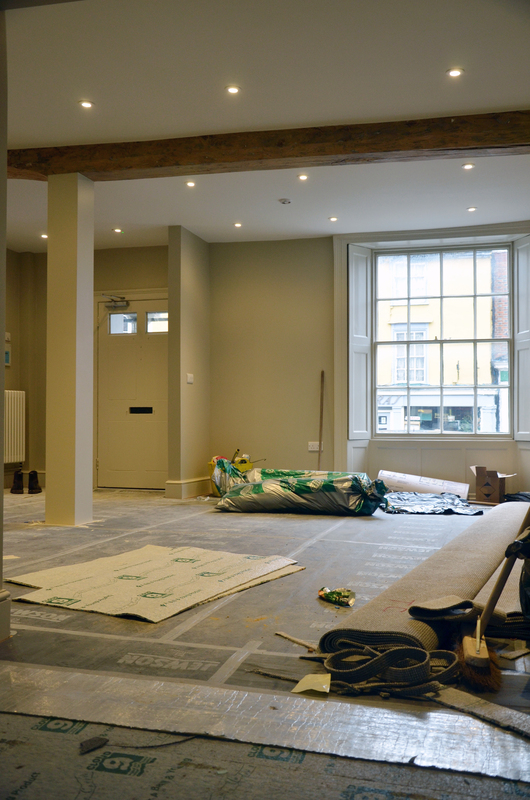 Upstairs we intend to convert three rooms into an (almost) open plan suite that has a flow to it that is conducive to a professional office. 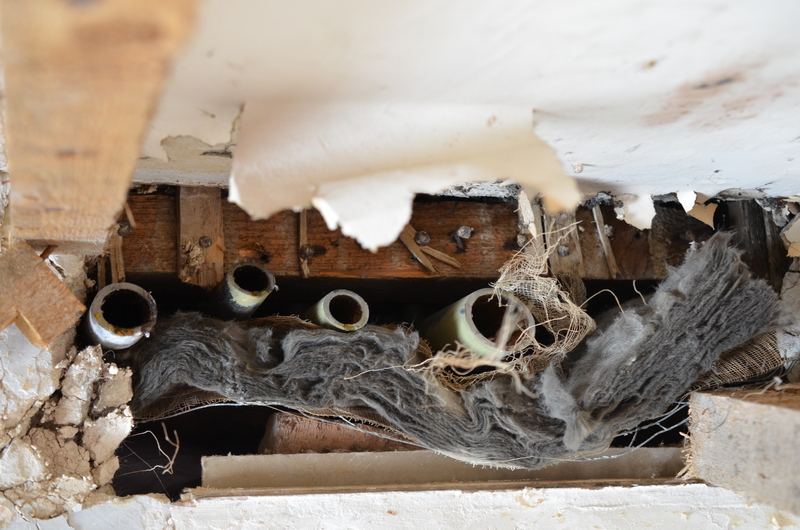 This involved opening up one of the back walls to the original building, complete with horse hair and dung plaster. The structure of the wall will be retained, and glazed, preserving and revealing its secrets at the same time. We also revealed an old door opening in the wall which we can probably utilize in the design of the reborn building, although not in the ideal position from a design point of view. An old book was found inside the wall, with a 1830 date. The subject? A book on mathematics dealing with the calculation of vulgar fractions. Conclusion, there were scholars living in the building at the time. 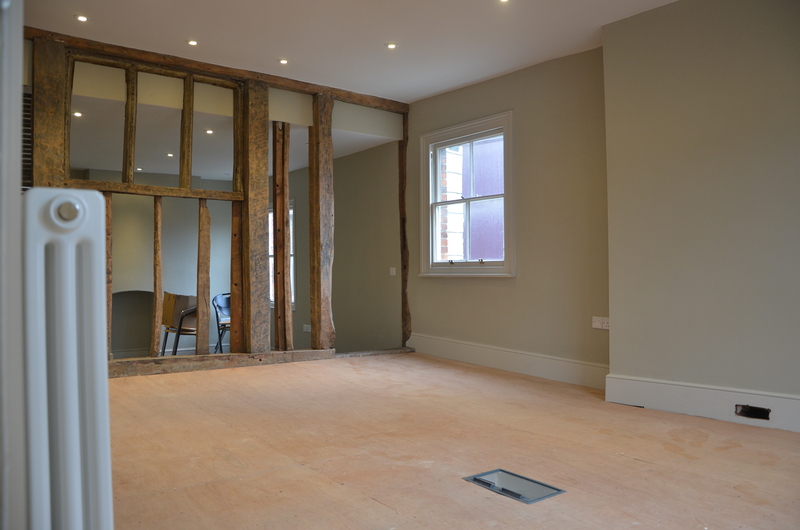 First floor partition, originally an external wall. All in all it is great fun taking the building apart. 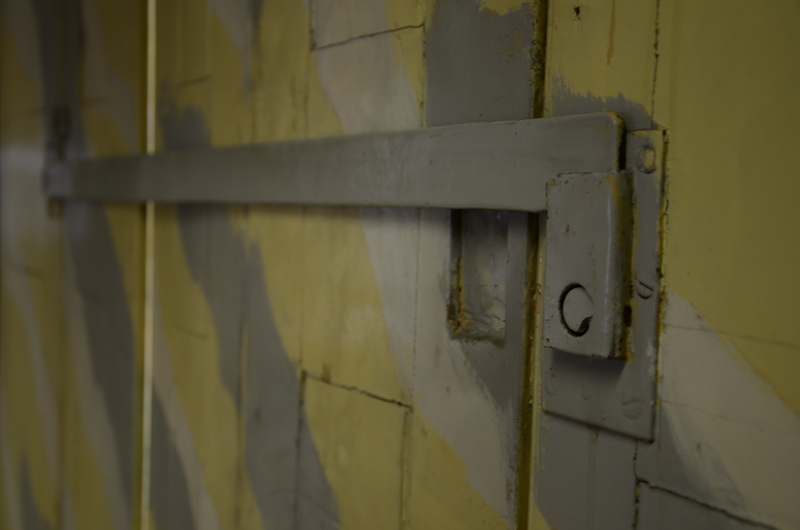 As its secrets are revealed our plans can change, but more importantly it gives us the opportunity to retain features that are worthy of retention. The next step is to have some asbestos removed. An inevitable hazard that comes with old buildings that have been renovated in the past. That work is scheduled to start tomorrow then we will have more builders strip, when we will make a start on getting external walls removed. Only then will we truly get a sense of the shape and form that the “new” building will adopt. I had woken early in the morning as it was still pitch black and deathly silent. I laid still in my rough sheets and waited. It was a long wait until the smallest of birds began to sing and then again it was silent. I decided to try and clean my small claustrophobic room but I could not because all the candles had melted down into gooey messes. There was always left a candle hidden on the top shelf but that was for emergencies only, plus I could not reach the cupboard as I am small for my age – 14 – just old enough to work for a rich family. I am a house maid. Maid of all work, basically. I’ve got long ginger hair. Mistress says I’ve got an attitude attached to it but I disagree. Sarah and Miss Pollen work with me. Sarah is a house maid like me but she’s 18. She’s very nice though. On the other hand Miss Pollen is mean to me. Suddenly, there was the tweet again so I decided to have a look. I’m never actually allowed to go into the Master’s garden because Mistress says that I’m a nosy little madam and I should mind my own business. I put on my scratchy uniform and itchy cap. I walked down the stairs carefully making sure that I did not allow the steps to creak. I tiptoed quietly down the hall making sure to feel my way through the walls as it was still pitch black. I tried to feel a doorknob but all I could feel was the rough plaster of the walls. There it was! There it was – the door. I could just about see a crack of sunlight coming through the bottom of the door. But wait a minute – was it sunlight? Surely Mistress had woken up by now? I reached out and felt the smooth doorknob. As I pushed the door the wallpaper cracked and broke. I gently pushed open the door and there was a soft creak. There was a magnificent, amazing Georgian garden before my eyes. There were rivers and trees, flowerbeds and streams. Right in the middle there was an absolutely enormous oak tree. There was a little blue piece of ribbon in my hair. I took it out and tied it to a little branch of the oak tree. I tied it on because it was special – my own secret garden. I stood there gazing at the wonderful things before my eyes. I was absolutely amazed. Wait! Where was my lucky brooch? I put it on this morning on my fabric apron. This was dreadful! I kept saying “I will find it” in my head but I could not see it anywhere. There was a man lurking in the far distance He was wandering over to me. He looked like a gardener by the clothes he was wearing but still I kept my distance. “Is there a problem?” he said. “Yes, I’ve lost my lucky brooch” I said. It has coloured stones in the shape of a peacock”. “I’ll help you find it then” he said. So together we searched and searched. Eventually we found it in a patch of blossoming red branches. “Thank you very much. It’s just this brooch was given to me by my long-lost mother” I said happily. “Well it’s very beautiful. You’re not too bad yourself” he said. But he had already gone. I looked into the far distance beyond the flowers and trees and saw a bright blue ribbon hung on the giant oak tree. So I skipped off past the vegetables, roses and poppies, tied my blue ribbon back into my hair and ran to the door. I approached the large oak door nervously. I was here to survey the old house to see if it could be used for anything. I fumbled with some keys at the heavy lock. The Georgian house loomed majestically over me, taller than the trees that grew around it. It had been built of ash wood and clay bricks, then painted dazzling white. It looked like it had grown straight out of the ground like a giant plant. Red roses climbed over the walls and ivy completely covered the house, turning it a brilliant green. The gravel path looked like plenty of people had walked down its pale grey stone. Small bushes lined the path, that needed cutting back. The door creaked open and inside was another world – darkness instead of bright sunlight and cold and damp instead of warm and dry. I flicked the cover off my flashlight and pressed the “on” button. I shone it round the hall and gasped in disgust as a small family of rats raced away from the light towards a dark hole that was obviously their home. I opened a door to my right and went into another dark, dreary room, but there was a door in this room too. I opened the door and came into another room with yet another door. I tried one of the keys and it turned in the lock. I was very shocked when the door opened because of the brilliant bright light that filled the room. Through the door a beautiful garden lay glistening with dew in the early morning sunlight. Forsythia and lavender lined the edge while statues covered with trailing ivy stood here and there and a fountain stood in the middle spraying clear blue water. Roses swung in the slight breeze and birds chattered in the trees. But in the middle was a huge slobbering guard dog! It turned its head slowly and stared at me with piggy eyes. It was slowly and menacingly getting closer. I spotted a path snaking away through the trees so I edged closer and broke into a run. The dog, although big, was also enormously fat so it was very slow. Its top speed was a walk so after one of the twists in the path I scampered up a tree and hid. The fat dog (who had no sense of smell whatever) lumbered past. I scrambled down the tree and raced to the door. I hurriedly opened it, my hand shaking with fear, and jumped inside. I slammed the door shut with a sigh. I reached into my pocket and closed my hand around two things; one was the key and the other was a tube of super glue. I locked the door, and then using the super glue, glued the door to the frame. I was safe. At last the work begins 1 – 3 Ock Street, Abingdon – on – Thames. 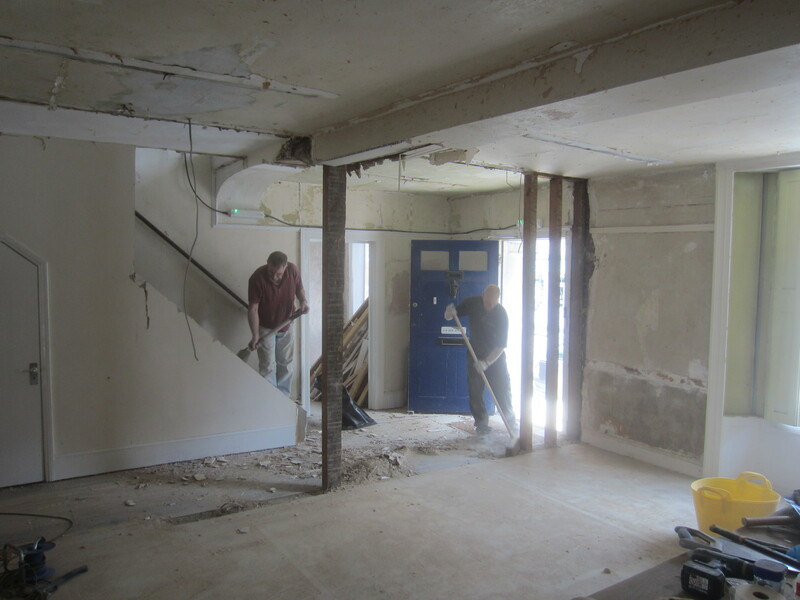 It has been a long time coming but finally we have made a start on the refurbishment of 1 – 3 Ock Street, Abingdon – on – Thames, Oxon. The reason for the delay in starting has not been planning, or funding, or matters of design, but simply that we have been so busy at Kemp & Kemp that we had to park our plans for the building for a few months. Now we are determined to press on, and finally the work was started last week. 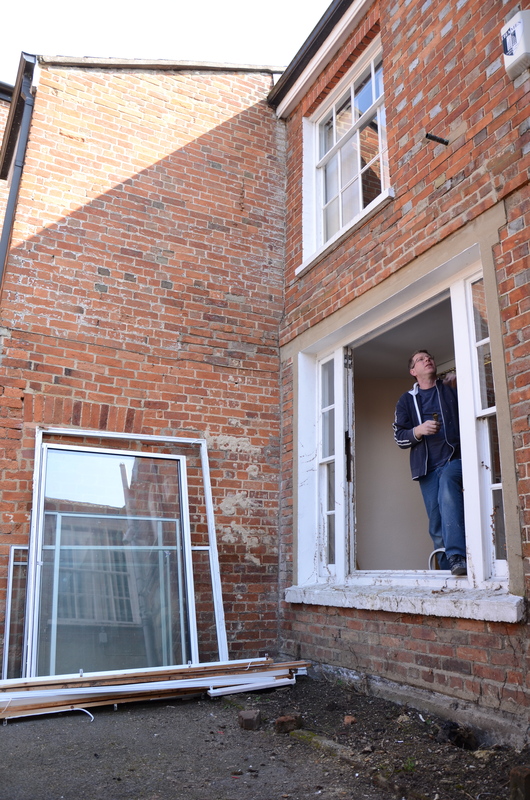 Steve at work on the sash windows. The first stage will be the strip out. The lighting and power circuits are to be renewed, as will the heating system, with the domestic water supply to be adapted and modified. So all the old installation, save for the existing boiler, will have to be stripped out. The prices are in and the contracts will hopefully be issued this coming week. More on that in the coming weeks. The next stage after that will be the building strip out. 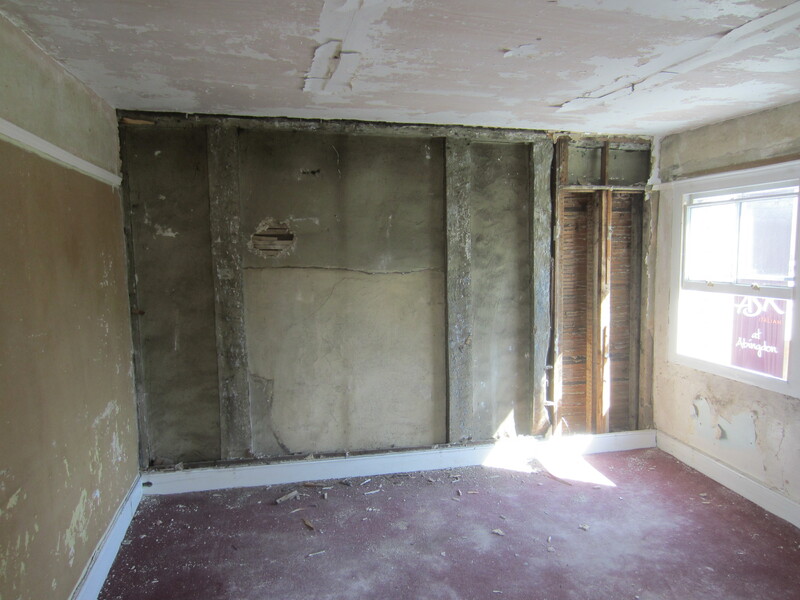 There are internal and external walls to be removed, windows to take out, new ones to install, and much making good. The building has been neglected for many a year and is in much need of a great deal of TLC. The services and building strip outs will be the start of that process. In the meantime we have been having the sash windows overhauled. Some were already in working order, but not many. Painted over, jammed, sash cords broken, or cut and in a generally neglected state, most of the windows were incapable of being opened. Maintenance work undertaken on them in the past had been clumsy to say the least, causing more harm that good. 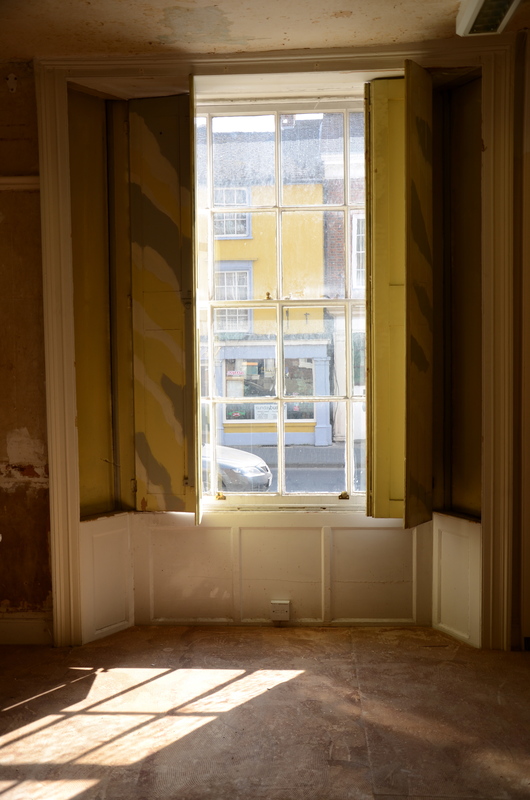 Some of the windows were even double sashes, with the inner sash since removed. 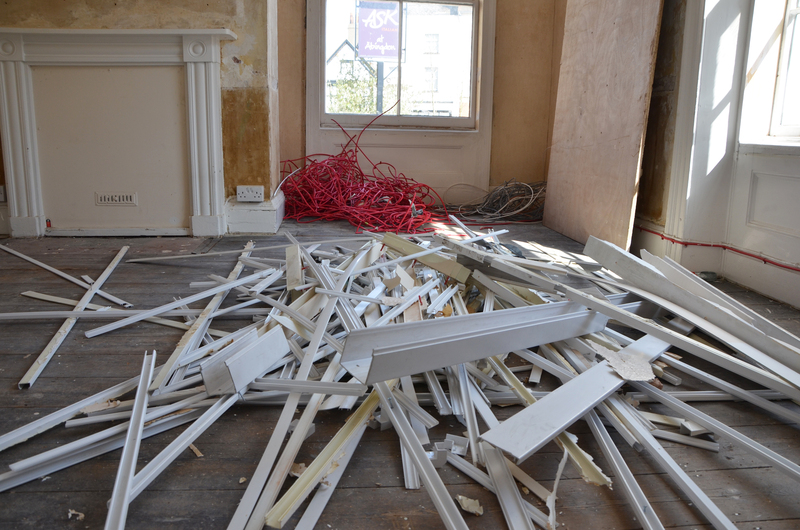 At the time they simply cut the sash cords and pulled the sashes out. A form of joinery cannibalism! Not that we are complaining too much, because the net result when the windows were opened up this week, is four redundant lead counter weights, totalling 60 lbs in weight, c.£80 in value. 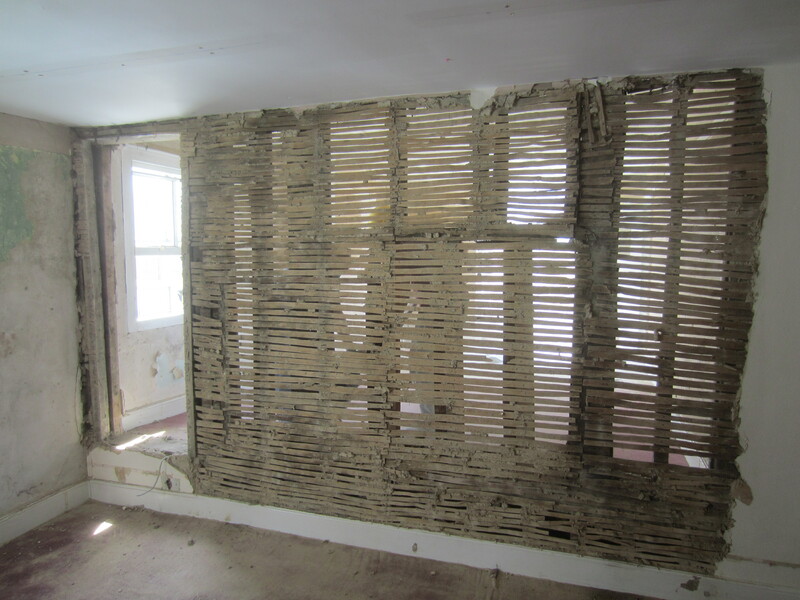 Another bonus has been the discovery of built-in shutters to one of the downstairs front windows. Steve, our joiner has taken great care over the window refurbishment. He discovered the shutters on finding a heavily painted hinge on what simply looked like a section of panelling. But, with a little care and some patient easing, 300 year old shutters complete with their original ironmongery were revealed. Sadly they are the only ones left in the building. The original 300 year old ironmongery to the shutters. 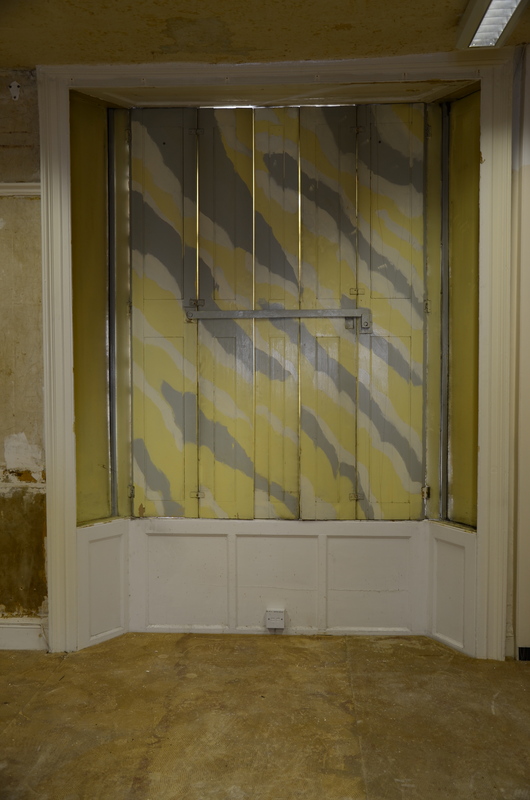 The camouflage painted shutters. Difficult to know when the paintwork was done. I woke up in my small house. I went downstairs. I ate my eggs and sausages. Then I went to 1-3 Ock Street to clean the dusty chimney. It was a shame I don’t get paid much. Next I saw the big blue door. My hand struck the door with fear. Finally the door opened and I walked into the house. The man said “Boy, that is the fire”. So I went up the chimney. Then the man just put on the fire. The chimneys are still there, and they are no doubt still dusty, but don’t worry Max, we won’t be asking you to sweep them. Local history has always interested me, so having bought 1 – 3 Ock Street it was inevitable that I would want to know some thing about its past. The history of the building is interesting enough, the way the gardens have shrunk as they have been lost to development, whilst the building itself has grown with the addition of Victorian and more modern extensions. But the history of the people who have lived in the building is far more interesting. 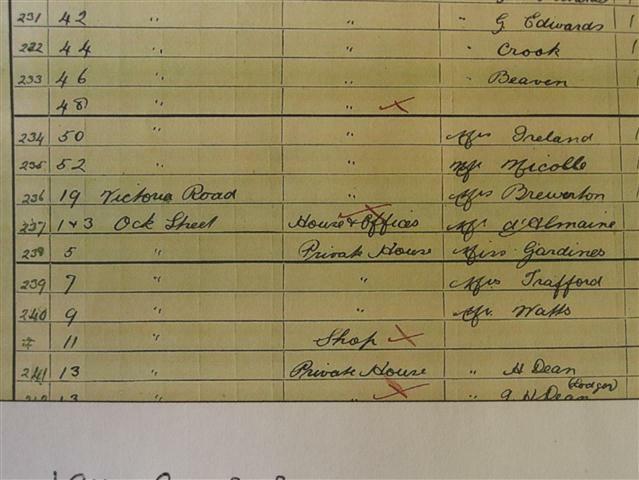 So my first stop was the 1911 census, the most recent of census’ to be published. Now, unfortunately, you cannot search the census records by address, only by surname. Since I did not have a surname I started by searching for well-known Abingdon names, until I found one living in Ock St. Then I simply had to trawl through the pages for Ock St until I reached 1 – 3. The first name I used, Wiblin, came up trumps straightaway. For those of you not familiar with census records, they are a mine of wonderful information. The names, ages and relationships of the buildings occupants, where they were born, their occupations, whether they could read/write, and whether they were lunatics or not! The record for 1911 described 1 – 3 Ock St as a House & Office occupied by Mr D’Almaine, along with 2 other females. I assumed his wife and daughter. It transpires that Harry George William D’Almaine, aged 50, was a widower, and he in fact shared his home with Ellen Kent (42), his domestic cook, and Margaret Emily May Dunn (22), his domestic housemaid. His occupation is listed as solicitor. Presumably he worked from home. The section headed Infirmity, totally deaf, or deaf and dumb, totally blind, lunatic, imbecile or feeble-minded” has been cut out for some reason but I think it is safe to say that it applied to none of the above. What is interesting though is the lack of any children. The column headed “children born alive” has 3 crossed out. In the column “children still living” it again has 3 crossed out. Under “children who have died” it states none! So a little mystery there that needs further investigation. Harry was born in Abingdon in 1860, but for some reason was christened in September of that year in Brighton. After schooling he moved to London and the 1881 census records him living as a lodger in Kenmont Terrace, Hammersmith, London employed as a 20 year old articled clerk to a solicitor. He married in 1889, and died, in Abingdon, at the age of 72, in 1933. I have also been able to establish that the D’Almaine name has probable Canadian roots. On July 28th 1927, Harry sailed to Halifax, Nova Scotia, on the “Newfoundland” from Liverpool. Six weeks later, he sailed back, from Boston, Massachusetts, USA, arriving at Liverpool on 12th September 1927 on the “Nova Scotia”. Some flying visit at the age of 67, and I am intrigued to understand why, a funeral, family business maybe, but whatever the reason it must have been important to have made such a long distance trip, for so short a period and at his age. Another trail to follow in due course. Harry’s father was Henry D’Almaine and his mother Mary. In the Kelly’s Directory of Berkshire for 1887, Henry is listed as the manager of the London and County Bank in the Market Place (now the Nat West Bank), the Hon. Treasurer to the Cottage Hospital in Bath St, and the Treasurer to the Corporation and Urban Sanitary Authority. 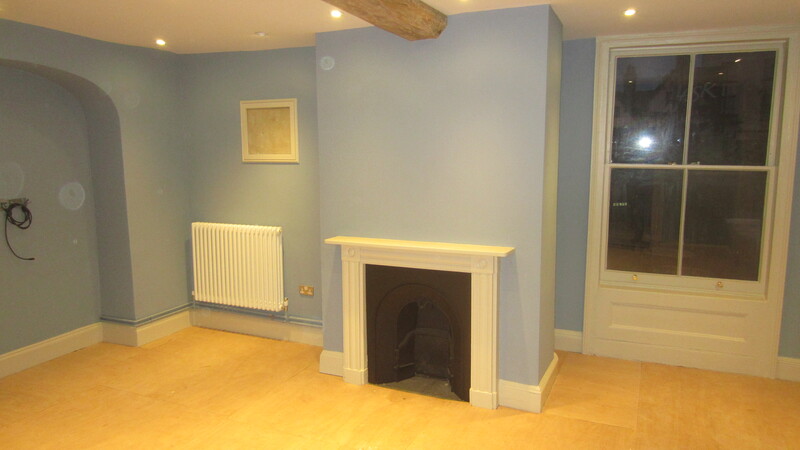 He is also listed as living at Mill House, Sutton Courtenay, Abingdon. So Harry came from a well-respected family. The final twist in this story is a sad one. Harry had a son, Roy, who joined the 9th Canadians, 49th Battalion in October 1914, part of the Canadian Infantry Expeditionary Force (Alberta Regiment). He was killed in action on the 4th Nov 1916, in France, and is buried in the military cemetery at Ecoivres, Arras. He was 20 years old, and a former Abingdon School pupil. Fittingly, his name is engraved on the war memorial, in the Square, opposite the very house he would have been raised in. Less fittingly, his loss is attributed to not only the wrong war, but the wrong service. 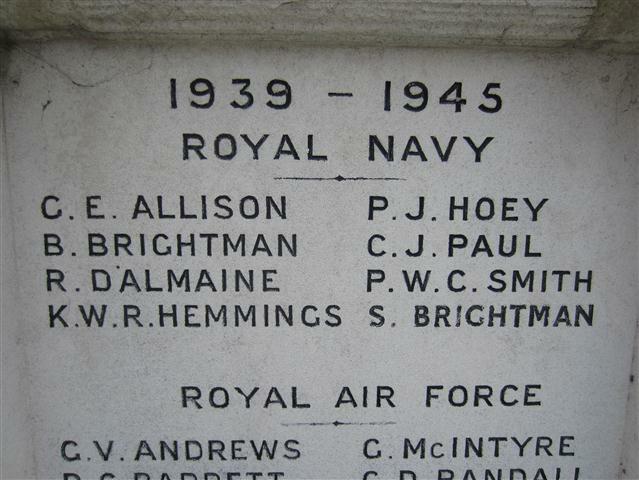 Roy D’Almaines name on the Abingdon War Memorial, The Square. I feel a campaign coming on. 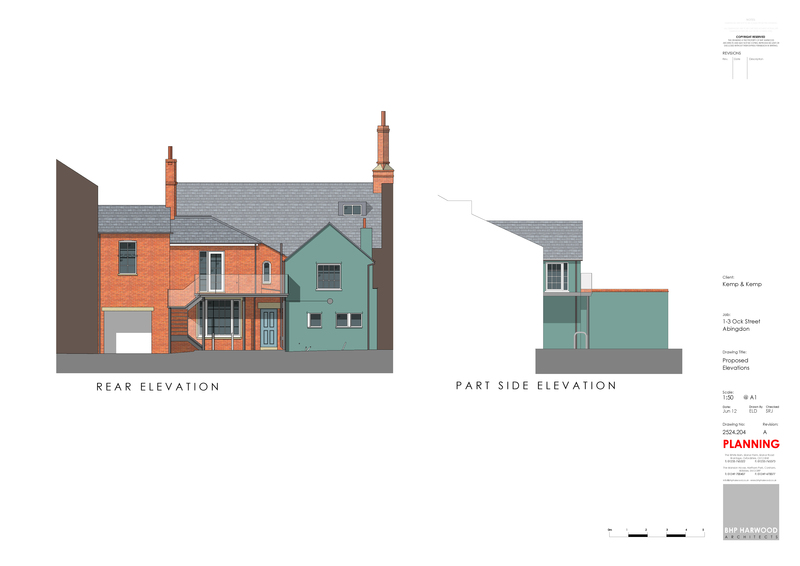 1 – 3 Ock Street, Abingdon – planning application is in! The planning application has now been submitted and has been registered by the Vale of White Horse District Council. 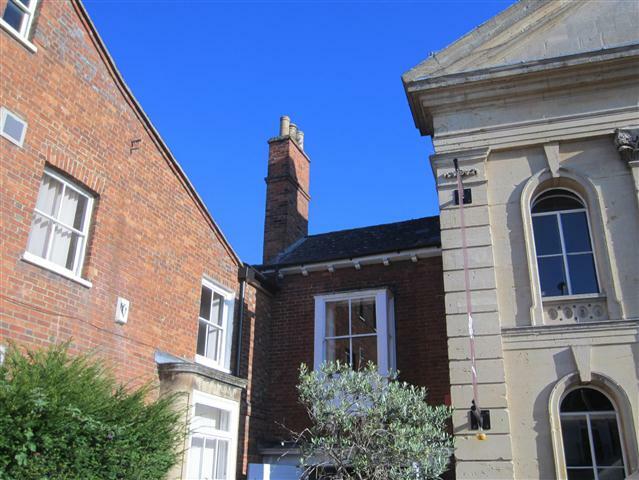 As posted earlier, the building is Grade 2 Listed and sits in the Abingdon Town Centre Conservation Area. So as well as applying for planning permission we have to apply for listed building consent too. We feel the proposed changes will breathe new life into what is at present an outdated, tired and somewhat neglected listed building. Our proposals seek to respect the history of the building, where possible restoring original features, whilst at the same time creating modern and useable office space. That special fusion of old and new. The importance of the front facade is evident from the listing schedule. In order to maintain the importance of this facade, the portico will be restored, the brickwork repaired, the stonework cleaned and the woodwork repainted in traditional Georgian heritage colours. The proposed development will comply fully with Local Plan Policy HE5 and with the NPPF requirements set out at paragraphs 128 and 129. In summary we believe that the proposed works will benefit the conservation and future of this heritage building as well as enhancing the character of the conservation area. Any comments on the proposals would be welcomed. Who would have thought it. 35 years ago I was involved in the acquisition of an office building in Abingdon, on behalf of Oxfordshire County Council and today that very same building is now owned by my business partner and me. My first job, straight out of school, was as a trainee surveyor in the Property Department to Oxfordshire County Council. 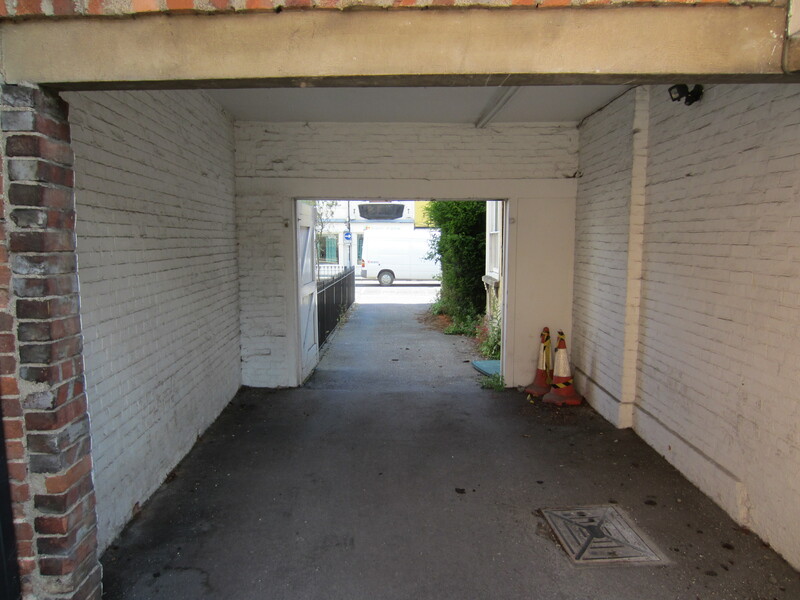 The work was very varied and gave me a good grounding in a profession that has treated me well, and of all the jobs I became involved in I remember driving into the courtyard of 1 – 3 Ock Street, Abingdon as if it were yesterday. The County were acquiring the building for occupation by the Probation Service, which at the time was a County function, but now, my business partner and I have bought the building from The Secretary of State for Communities and Local Government. We completed on the purchase two weeks ago. Yet buying the building is probably the easy bit. The challenge now is to breathe new life into a beautiful building that has not seen much love and affection for many a year. The building is late Georgian and would have originally been built by a local merchant or professional as a fine residence with substantial grounds. Over the prevailing years the building has been extended, on occasions with not much care or thought, whilst the gardens have slowly been lost to surrounding development. 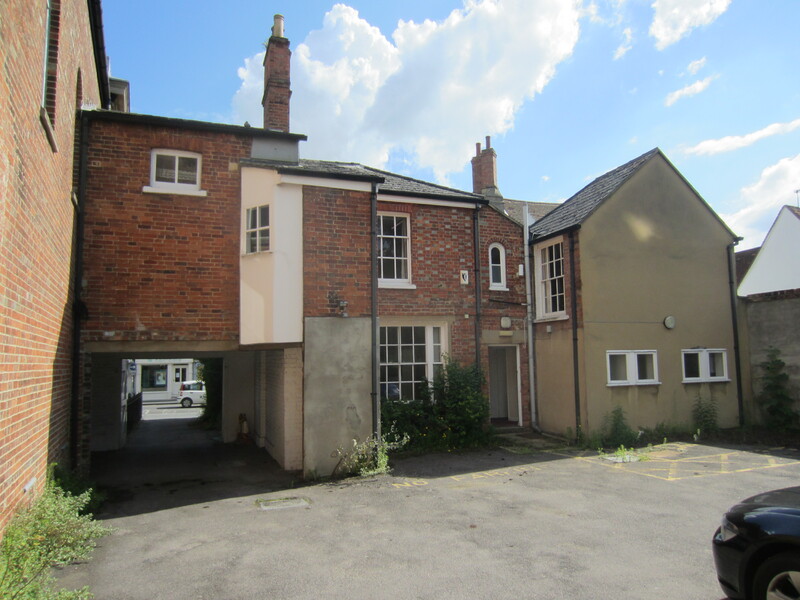 But what we have now is nonetheless a fine well-built property that has since been converted to commercial use, with a rear courtyard, accessed under the existing building, that provides parking for 6 – 7 cars. 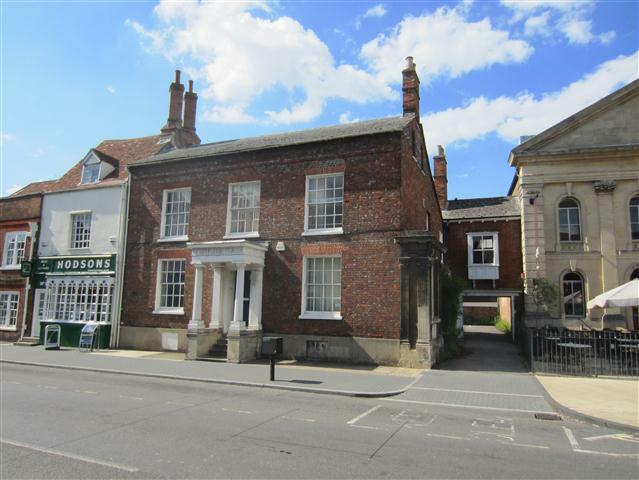 Extending to approximately 2,500 sq ft, the building is Grade 2 listed and is situated in a Conservation Area. So there is much to think about and consider. Our plans are to restore the building to its former glory, returning some of its original features, as well as rendering the building “fit for purpose” as an office building. This needs to be done with sensitivity whilst recognising that merging old and new, or modern if you prefer, can be difficult to achieve, but a very successful fusion if you can get it right. We intend to get it right, but appreciate that to achieve that involves the co-operation of the architect, planners, conservation officer and of course the owners. The layout plans are well advanced, we have had an initial meeting with the Conservation Officer and the planning application should be submitted next week. Whilst the application is being determined we will finalize the specification and go out to competitive tender. We hope to have the builders in within 2 – 3 months, and for the building to be available for occupation before the end of the year. It will be tight. I intend to post regularly on the rebirth of this building, so why not “tag” this blog and keep up with its progress.